Break and demolish concrete with the drop hammer attachment. To efficiently break up concrete, the drop hammer delivers over 3,600 foot pounds of impact energy combined with a fast cycle time of 20 blows per minute. Upon impact, the drop hammer fractures the material below the surface, leaving the surface free of jagged debris. Between cycles, the drop hammer attachment allows three seconds to reposition and reset the loader. When the attachment is not in use, the hammer stands in the upright position. 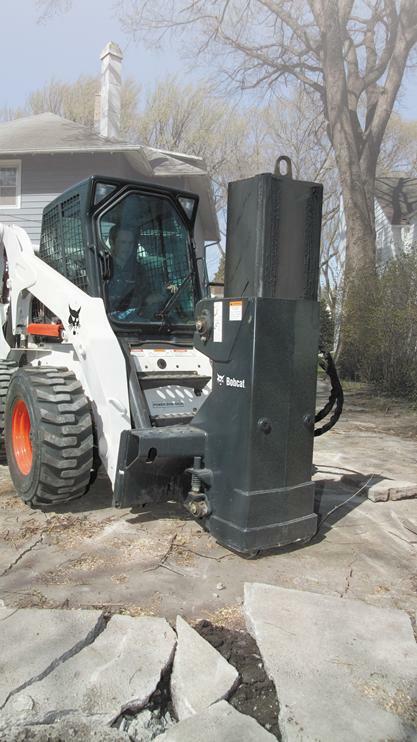 Compared to standard hydraulic breakers, the drop hammer attachment generates little vibration or noise, meaning less wear on the machine and less noise for the operator and bystanders. The drop hammer features a chain mechanism with a catch. The catch grabs the weight and raises it up. When the chain rotates over the top, the catch falls and releases the weight, dropping the hammer onto the material to be demolished. Cushioned Safety Valve: Unique in its industry, the cushioned safety valve allows the operator to stop the hammer in mid-stroke and slowly lower it to a resting position, preventing the hammer from falling if the hydraulic flow is shut off. Drive Motor: Powers the drop hammer attachment with chain drive. Effective Breaking Power: Delivering over 3,600 foot pounds of impact energy for quick and efficient demolishing action. The drop hammer features a 38-in. stroke and a hammer weight of 1,165 pounds. Fast Cycle Time: Delivers a fast cycle time of 20 blows per minute with three seconds between cycles to reposition and reset the loader. Upright Position: When not in use, the hammer stands upright. Also, stores and transports in the upright position. Locking Mechanism: Prevents weight from sliding out top of hammer during transport. Bob-Tach™ Mounting System: Makes easy work of attaching and detaching the drop hammer from the loader. Fast and easy mounting means spending less time on attachment changes and more time on the job.